When you’re trying to sell your home, little things can make a big difference. Potential buyers may be turned off by some minor rot on a post in the crawlspace or a little mildew at the bottom of a bedroom closet. Or perhaps they don’t see any mold at all, but their noses tell them something is amiss. The savvy home buyer, suspecting mold contamination, may ask for a mold inspection from a professional mold testing and remediation company. If serious mold contamination is discovered, it can derail the transaction or, at the very least, provide a reason for a reduced sale price. Pro Restoration, Inc. specializes in mold removal and water damage restoration in Greater Los Angeles County. As the area's certified disaster restoration company, we are well aware of the effects that a flood or fire can have on a property. If the problem is not dealt with in a timely manner, the threat of mold can become an issue. If you recently had water damage or a fire in your home or business and are worried about a potential mold problem, or you think you may already have mold growth, contact the experts at Pro Restoration, Inc. today for a complete mold inspection and mold remediation. 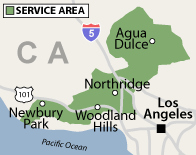 We serve Van Nuys, Woodland Hills, Westlake Village, Sherman Oaks, Canoga Park, and the nearby Greater Los Angeles County area of California. Contact us for a Free Estimate and inspection. We can eliminate unwanted mold from your home – and keep it from coming back! If you suspect you have a mold problem, don’t wait until your house is on the market to fix it. Real estate agents recommend taking care of problems like this long before you begin price negotiations. They point out that you will likely pay more if you procrastinate. Not only may the problem worsen, but lengthy periods on the market invariably lead to a lower sales price than your house would otherwise deserve. In addition, fixing a problem at the last moment typically costs more than having the job done beforehand – when you can negotiate the best price from a mold removal company. Besides, if you rid your home of mold now, you can enjoy your remaining time in your home knowing you’ve cleared the air of mold spores that can affect your health and the health of your family. Give us a call at 1-855-512-6813 or contact us online to schedule an estimate for mold removal in Woodland Hills, Westlake Village, Sherman Oaks, Canoga Park, Van Nuys, Newbury Park, Pacoima, Granada Hills, Northridge, North Hills, Encino, Calabasas, and surrounding areas throughout California.